Today's marketplace is hypercompetitive. Brands compete for attention, hoping they can turn that attention into a loyal customer. But too many companies are not able to build a long-term relationship that results in a loyal customer because the customer had a poor experience. To remain competitive, brands need to create compelling integrated customer experiences that continue to evolve and reduce the friction between company and customer over the lifetime of the relationship. 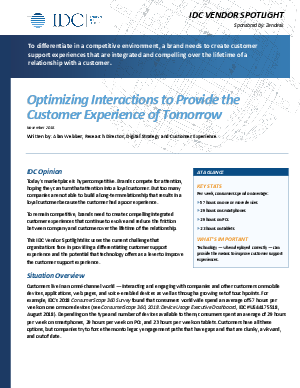 This IDC Vendor Spotlight discusses the current challenge that organizations face in providing a differentiating customer support experience and the potential that technology offers as a lever to improve the customer support experience.